Read and comment on this story from WBZ4 News on Senator Kerry and his call for a "new era of service,'' Sen. John Kerry proposed a $3.5 billion plan Monday to encourage Americans of all ages to make a difference in their communities. Speaking at an American Legion hall, Kerry described his military service in Vietnam as the defining moment in his life, and said he wants such service to define the nation. He said learned about duty and obligation from his parents and, with a wavering voice, read a letter his mother wrote to his father during World War II. Kerry's plan also calls for expanding the Peace Corps from 6,700 members to 25,000. "If there was ever a time when everyday people in the most deprived countries, cities and villages of he world need to see the idealism of the United States of America, it is today in the aftermath of September 11th," he said. MANCHESTER, N.H. (AP) Calling for a "new era of service," Sen. John Kerry proposed a $3.5 billion plan Monday to encourage Americans of all ages to make a difference in their communities. The Democratic presidential hopeful from Massachusetts said programs ranging from "summers of service" for teenagers to mentoring jobs for retirees would involve more than a million Americans each year. "Nothing I hope to do as president will be more vital than reconnecting America's public life to the ideal of citizenship," he said. Speaking at an American Legion hall, Kerry described his military service in Vietnam as the defining moment in his life, and said he wants such service to define the nation. He said learned about duty and obligation from his parents and, with a wavering voice, read a letter his mother wrote to his father during World War II. "You have no idea of the ways in which one can be useful right now," she wrote. "There's something for everyone to do." "We need a new era of service," Kerry said. "Not an effort for one time, one purpose or one group but a permanent and national endeavor." The centerpiece of Kerry's plan is a "service-for-college" initiative, which would offer students the equivalent of their state's four-year public college tuition in exchange for two years of service. His goal is to enroll 500,000 young people a year in the plan within the next decade. "This will simultaneously strengthen our society, enhance our economy and advance our values by opening the doors of higher education to those who respond to a higher sense of duty to make our country better," he said. He said the AmeriCorps service program, a kind of a domestic Peace Corps created under the Clinton administration, was a good start, but that more needed to be done. Aides said Kerry's college program alone accounts for about $2.5 billion of the package's annual cost, but could be paid for easily through closing loopholes in the federal budget. "It's a total of $3 billion to $3.5 billion, which measured against everything else that we are doing today is easily affordable," Kerry said. "That's closing one loophole ... it's just not an expensive, complicated program." The college program is similar to one proposed earlier this year by one of Kerry's rivals, Sen. John Edwards of North Carolina, who would provide one year of college tuition to students who work 10 hours a week at part-time jobs or on community service projects. Both Edwards and Kerry also propose making community service a graduation requirement at all high schools. Under Kerry's plan, states would design such service programs, which would be paid for by the federal government. They would require 50 to 100 hours over four years of high school, Kerry said, and consist of such jobs as cleaning up neighborhoods, spending time with the elderly and tutoring younger children. Kerry's plan also calls for expanding the Peace Corps from 6,700 members to 25,000. "If there was ever a time when everyday people in the most deprived countries, cities and villages of he world need to see the idealism of the United States of America, it is today in the aftermath of September 11th," he said. The terrorist attacks on that day highlight the Bush administration's indifference to community service, Kerry said, chiding the president for turning aside proposals to tap into the wave of volunteerism that emerged after Sept. 11. "He said he would 'rally the armies of compassion,' but he left them high and dry without the resources to wage their battles and with a leader who is absent from the cause he claimed to profess," Kerry said. After the attacks, the president created the USA Freedom Corps, an effort to coordinate federal office on volunteering. It set up a database to help people find local organizations that need volunteers. "The Democrats continue to try and break away from the pack. If Senator Kerry would like some good ideas on inspiring volunteerism and community spirit I suggest he visit www.usafreedomcorps.gov," said Julie Teer, spokeswoman for the New Hampshire Republican Party. "Senator Kerry's attack du jour is simply his latest effort to pull ahead of the undecideds currently beating him in the latest New Hampshire presidential primary polls," Teer said. WASHINGTON (Reuters) - U.S. Democratic presidential hopeful John Kerry said on Thursday the United States will not be safe from terrorism until it works with other nations to modernize and build democracies across the Middle East. Like many other Democrats, the Massachusetts senator also urged President Bush not to rush into war with Iraq. Calling for a "bold, progressive internationalism" in U.S. foreign policy, Kerry said what he called Bush's "unilateralist" approach was dangerous and the United States should lead a drive to bring freedom to the Middle East. 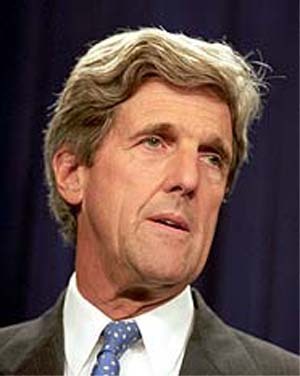 "The Bush administration has a plan for winning the war (against terrorism) but no plan for winning the peace," said Kerry, a decorated Vietnam War veteran who has made foreign policy a key component of his campaign for the Democratic presidential nomination for 2004. "What America needs today is a smarter, more comprehensive and far-sighted strategy for modernizing the Middle East," he said in prepared remarks for a speech at Georgetown University. "It should draw on all of our nation's strengths: military might, the world's largest economy, the immense moral prestige of freedom and democracy and our powerful alliances." Kerry said a combination of political repression, economic stagnation, population growth and lack of education had created an explosive mix on the streets of the Middle East, creating a breeding ground for hostility to the West. As a result, winning the war on terrorism required not only hunting down terrorists who plot against the United States but building a better future for all in the Middle East, he said. He hearkened back to Cold War efforts to rebuild Europe and reach out to the world through programs like the Peace Corps that "put American idealism to work in developing countries." "With creative leadership, the U.S. can enlist our allies in a sustained multilateral campaign to build bridges between the community of democracies and the greater Middle East," he said. Kerry, one of six Democrats vying to be the party's presidential candidate at the end of next year, said the Bush administration's "blustering unilateralism" was wrong and dangerous. "It has meant alienating our long-time friends and allies, alarming potential foes and spreading anti-Americanism around the world," he said. Kerry, who voted in favor of a congressional resolution giving Bush the authority to wage war in Iraq, said disarming President Saddam Hussein was a key component of peace in the Middle East, but the administration should exhaust its diplomatic avenues before launching war. "They must take the time to do the hard work of diplomacy," Kerry said. "They must do a better job of making their case to the American people." "Mr. President, do not rush to war," he said. He called for significant investments in education and infrastructure in developing countries in the Middle East and said the United States must launch a high-profile regional trade initiative to spark growth there. Give me a break. He has done nothing in the Senate for safety and health care for Volunteers. He just wants the spot light. Howard Dean would ensure Safety, Health and Attrition rates would decerease while funding an increase in Peace Corps and its program. A good Doctor is in and running. Kerry has never helped in reforming Peace Corps in the Senate. Why would he start he if he even was considered by his party to be the nominee. He has never helped me personally and he is my Senator. Glib speech is cheap. Watch his feet.